The fact is that fishing in Southeast Alaska isn't especially hard. You're going to catch fish with almost any reputable charter or lodge you choose. The real difference is in the experience. You can catch a limit of silver salmon and have a day you'd just as soon forget, or you can catch a limit of silvers and have a day you'll always remember. Our highest priority — even higher than catching fish — is making sure you have a great experience. That means, among other things, providing the best tackle money can buy and maintaining our equipment to maximize your safety and comfort. It also means pairing guests with friendly, enthusiastic and skilled captains. 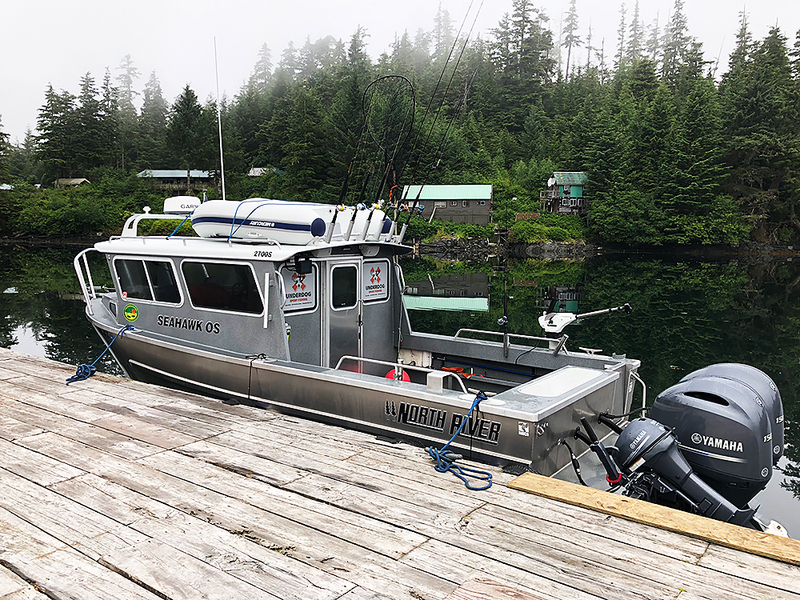 Our primary charter boat is a 2018 North River Offshore 2700S powered by twin 2018 Yamaha F150s and purpose-built to stand up to season after season of Alaska fishing. This new boat will bring a new level of convenience, comfort, and reliability to our operation. Your safety, comfort, and success are our priorities, and the rigging of our new boat reflects that. In addition to all USCG requirements, safety equipment includes a life raft, EPIRB, redundant VHF radios, and an Iridium satellite phone. She seats 7 in the heated cabin and has a private head. For fishing, she's rigged with a reliable, quiet and efficient Yamaha 9.9 hp kicker, an advanced Cannon Tournament Series downrigger, and a full complement of Garmin electronics including a touchscreen multifunction display, 18-mile radar, and a powerful transducer for superior resolution of suspended bait, salmon, and bottom-dwellers. Delivery is expected May 15, with rigging complete by June 1. Follow us on Facebook for build updates. Daily use in Alaska is tough on tackle. Daily use in remote Port Protection is even tougher. That's why we replace most of it every year and keep extras of everything on hand. For mooching and downrigger trolling, we use Lamiglass "Kenai Kwik" rods — which we consider the finest salmon rods at any price — matched with Shimano Tekota 600LC line counter reels. For bottom fishing, we use the new Accurate Valiant 500 and 600 two-speed reels, loaded with Jerry Brown Spectra braided line. We consider the Valiants the strongest, lightest reels on the market, allowing you to fight the fish, not the tackle, making for a more enjoyable day on the water. Capt. James, the owner of Underdog Sportfishing, has fished Southeast Alaska for 20 years, both recreationally and commercially, and has held his captain's license for 15. He has guided and fished all over the world for everything from giant bluefin in Nova Scotia to wahoo in the Bahamas, but Southeast Alaska is hands-down his favorite fishery. Also a well-known hunting guide and an accomplished videographer, he knows the woods and mountains just as well as the waters.